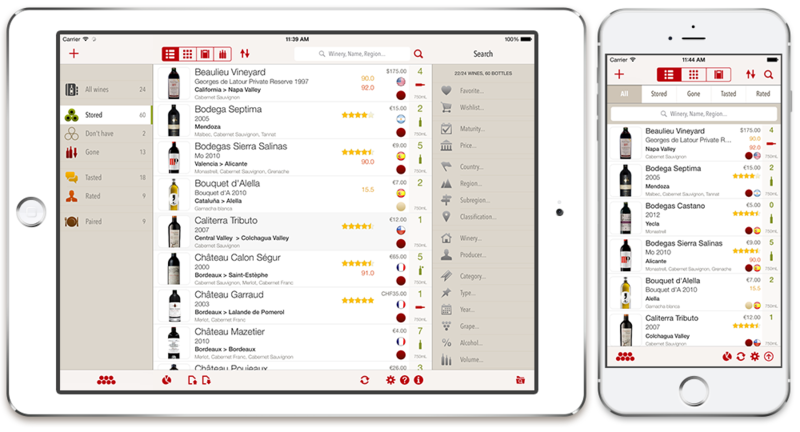 Manage your wine cellar and tasting notes like a pro. Track the history of your cellar (stored and gone bottles), draw and fill your racks and shelves, record your tasting notes and pro ratings from world guides, and pair dishes for every wine. Full wine summary with image, wine name, vintage and location, varietals, current price, category, number of stored bottles, maturity icon, volume, last tasting score and last pro rating set. Need to find the 2007 autralian shyraz from the Barossa Valley, drunk last month with your friend Bob, whose price was between $15 and $20, with a 91 point score? You can! List, sort and order your wines properly by winery, wine name, year, price, score, region, appellation, input date... Use one of 3 types of display (list, grid, full screen). Manage up to 3 photos for each wine (for example: full bottle, front label, back label) from your device camera or library. Use the edit image tool if you want to crop them. 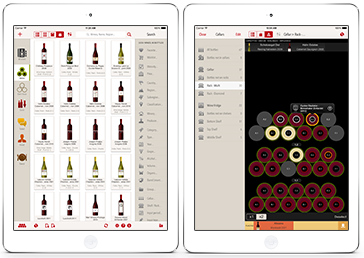 Complete each wine sheet using up to 40 fields (depending on knowledge and needs) with our pre-filled database. Build your cellar or wine fridge using 1 of our 44 different shapes. Multiply cols/rows and use block repetitions, manage 2 depths shelves, and change cols and rows legend. See your bottles in position with graphical representation (category, capsule...). Move/place each bottle using double tap. Use 'Show in cellar' feature to highlight and find a bottle. Manage the life of bottles. Set the input date, price, type, comment, and provider. When the bottle is taken out, set the output date, output type (drunk, offered, sold...) and recipient. Manage tastings (event, date, main notes, sight, olfaction, taste) with the score scale you prefer (5 stars, 100 points, 20 points...). Add pro ratings choosing from 50 world guides. Pair each wine with dishes. Cellar valuation. Statistics with graphics and percentages for wines, bottles, categories, years, grapes, countries, regions, subregions... Also sort your purchases by periods and by providers. Access our international wine database to save time when entering your wines. Find a wine by typing its name/winery. 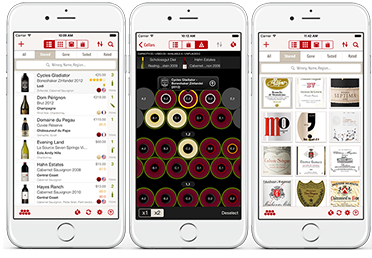 If the wine is not found, add it manually using the app database of countries, regions, subregions grapes in less than 1 minute. Search the current market price (wine bottle valuation) for each wine. Search for merchants all around the world to compare prices and to get their address or website. Sync your collection of wines with your VinoCell server account between as many devices as you want. For example, your iPad, your iPhone and your wife's iPhone. No need to use the same iCloud and AppStore account. Need more details about app features? Discover the iPhone & iPad versions in images and videos. 2 millions sync wines... and growing! 50.000 users around the world. Please, read manuals before asking for help. Please, write in English or French.